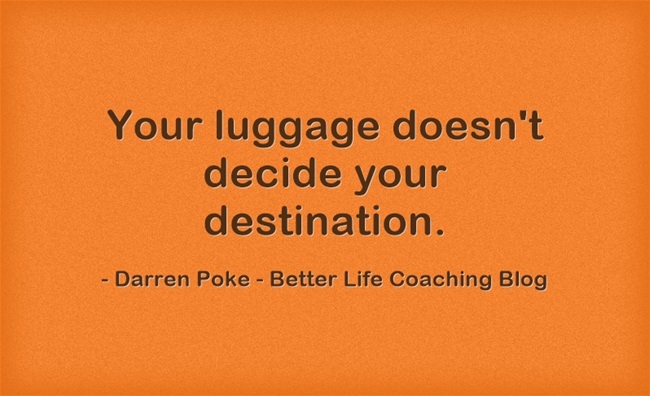 Your luggage doesn’t decide your destination. Yesterday’s failures don’t have to hold you back from tomorrow’s successes. Your past doesn’t need to define your future. We’ve all had our share of disappointments and set-backs, some more than others, but those who are able to achieve great deeds do so in spite of the challenges that they have had to overcome. Let me encourage you similarly. You have a job to do, a calling, a vocation. And this task is ahead of you, not behind you. It’s success will be due to what you do from now on, not due to what’s happened previously. So don’t look over your shoulder and don’t dwell on your past, but stay focused on what you’re aiming for in the future. Because you’re luggage doesn’t decide your destination, you do!